I took a secret photo on the tube last week. 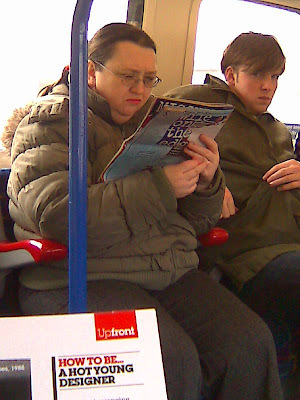 A lady reading crapmag Take A Break - she was totally engrossed in the Wife On The Edge article. I think the passenger next to her noticed me - although I didn't notice him at the time. I love the contrast in aware/unawareness between the two passengers. Oh dear has it been that long? I've been busy. Busy fighting my creative demons and creating you see. Actually I've been really busy on twatbook and twitter too if truth be known! I joined Twitter bloody ages ago - even before Stephen Fry who is the Lord Emperor of all that is Twittle. He even made me his friend after I commented on one of his twittles or twits or tweets or whatever they are called so I must say I am truly twittily honoured. There is something quite radically comforting and useful having to microblog in 140 characters or less. You can follow me at twitter if you so desire - I'm @rockmother not surprisingly. Don't all rush at once! Aagh - take the scary lady with her record-breaking talons away - away I tell you! Despite the fact Lee Redmond has been rather admirably been growing her nails for 24 years at a combined length of just over 28 foot they are (in my opinion) disgusting! They make my toes curl - in the same way droopy hairy ears do. And as for varicose veins - I have been known to publicly retch on catching sight of some poor unfortunate's knotted calves. Ironically, Lee the nail lady from Salt Lake City (weirdo Mormon capital of the world) who looks like a cross between an alien and Bill Bailey has just lost her extra-long nails in a terrible car accident. I wonder if she will grow them again? 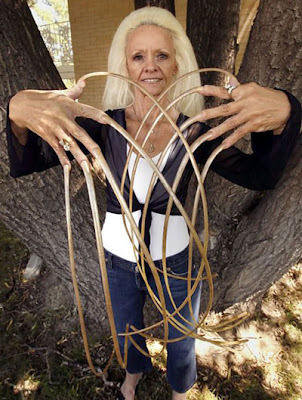 How on earth has she managed to function all these years with nails that long? I would go to youtube as I am sure there is footage of her at home showing us how but someone else can do that and report back please. And if you are still reading and haven't had enough click here for Times article on a guide to 100 best blogs - cue feverish searching. How many on the list have got book deals I wonder?